The core of the problem is that Palestinian recognition of Israel as the state of the Jewish People would not only end the dream of the return to Palestine, but also of the destruction of Israel currently being implemented through the incitement and terrorist campaign waged by the Palestinian People in their institutions, mosques, schools, terrorist organizations and foreign propaganda centers. Their strategic intention is to perpetuate the conflict, not end it. The real reason Mahmoud Abbas wants control of the bridges and crossings, and refuses to leave them in Israeli hands, is to duplicate the terrorism of the Gaza Strip -- to smuggle in arms and establish terrorist squads. Crossings left in Israel's hands would mean greater security for Jordan as well. The world watches while the Palestinian Authority is actively promoting a campaign for an academic boycott and economic sanctions to be imposed on Israel, evidently backed by veiled threats from U.S. Secretary of State John Kerry. First, every Muslim knows that the Jews in Israel are the descendants of the ancient Hebrew nation known as the Israelites, we also recognize the fact that the Jews have been connected to the blessed land of Palestine for thousands of years, even before the Romans conquered Judea and changed its name to Palestina, as attested to by history. The ties of the Jews to the Holy Land have been documented by all the sacred books, including the Holy Qur'an. Now, while the Jews are determined that the Palestinians recognize the State of Israel as the national homeland of the Jewish People, the Palestinian Authority [PA] unfortunately rejects this demand. High-ranking PA figures claim that the Jews do not have religious or historical claims to the Holy Land. The Jews took the land by force, they say, and therefore want to reinforce their tenuous link to it by having the Palestinians recognize the State of Israel as the Jewish national state. The real reason for their refusal to recognize Israel as a Jewish country, however, is that the rais [chief], President Mahmoud Abbas, the man who claims to be the leader of the Palestinian people, has never abandoned the demand for the return of the Palestinians to "Palestine," that is, the entire State of Israel, so that it might be destroyed. The Palestinian rais also interferes personally in the affairs of the sovereign State of Israel, especially in matters concerning Israeli Arabs. As part of the negotiations brokered by U.S. Secretary of State John Kerry, Abbas demanded the release of Palestinian terrorist operatives holding Israeli citizenship. He claimed he refused to recognize the State of Israel as a Jewish state because he felt responsible for the rights of the 20% of Israeli citizens who were Palestinian Arabs. He uses that claim, however, to hide his true intentions. 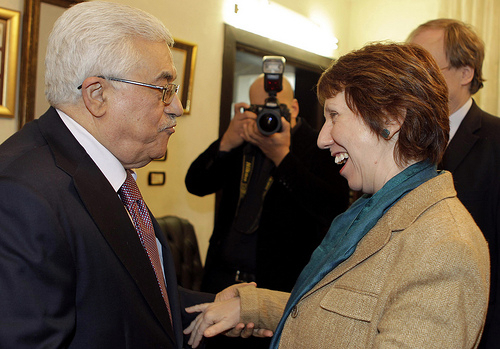 If Mahmoud Abbas really wanted to found a Palestinian state bordering on the State of Israel, he would have been only too happy to accept the suggestion made by Israel's Foreign Minister, Avigdor Lieberman, and rushed to absorb Israel's Arab citizens along with their lands and assets as part of the exchange of territories and population demanded by the peace agreement. In that way he could have increased the size of Palestine, liberated the Israeli Arabs from the Israeli regime that Palestinians call "the rule of occupation and apartheid," and brought more territory and citizens to his new country. The truth, however, is that what President Mahmoud Abbas is really planning to establish is a Palestinian state between the Jordan River and the Mediterranean Sea, by flooding the State of Israel with Muslim Palestinians as part of the so-called "return" of the Palestinian refugees. He does not want an Israel next door to the Palestinian state, and therefore refuses to recognize it as the national homeland of the Jews. In reality, the Jews of Israel do not need recognition from the Palestinians; the Palestinian people itself is new, having been created only recently, and barely meets international criteria for the definition of "a people." Very few Palestinians have been there for many generations. Most of them are from various isolated families, tribes and groups with no common history. Either they came with invading armies, or were imported as cheap labor by the Turks and British, or wanted to profit from the economic advances made by the Jews who had returned to rebuild their homeland. Others fled to Palestine from neighboring Arab countries because they were involved in blood feuds and feared for their lives. The random collection of people who arrived from around the Arab-Muslim world and gathered in the Land of Israel, especially during the past two centuries, was ruled by different occupiers, primarily the Ottoman Turks. The population was divided and riven by disagreement, and came to look upon itself as a national group only at the beginning of the 20th century. The Jews have had a common identity for nearly three thousand years. Unlike the Jews, the Palestinians are not documented in the Holy Qur'an or the Old and New Testaments. There is no documentation of their presence in Palestine, in the history books of the ancient or modern world or in books written by travelers who came from overseas over the centuries, such as Mark Twain's Innocents Abroad. The Jews in Israel have a number of reasons for demanding their country be recognized as their national homeland. For the Jews, Palestinian recognition of the State of Israel as the national homeland of the Jews means the end of the conflict. They want to be sure that a Palestinian state bordering on Israel is the Palestinians' final demand and that they accept the fact of Israel's existence. They want to be sure the Palestinians will not try to use force or subterfuge to change the Jewish majority in Israel. They want to be sure no attempt will be made to force Israel to accept the return of the grandchildren and great grandchildren of Palestinian refugees who have already been settled in the neighboring countries and should remain there with their Arab brothers even after the regimes have stabilized in the wake of the Arab Spring. The end of the Israeli-Palestinian conflict basically means mutual recognition. The Palestinians, on the other hand, find it difficult to recognize Israel as the state of the Jewish nation in Palestine. They claim that the demand was never made of the Egyptians or Jordanians before they made peace (treaties with those two countries dealt mainly with territory). As far as they are concerned, as soon as the Palestinians recognize Israel as a Jewish state, their claims and the demand for all of the land of Palestine, from the Jordan River to the Mediterranean Sea will no longer be considered legitimate. The Palestinians demand a state for themselves, and also demand to settle their citizens in Israel, the neighboring Jewish state. This hypocrisy increases exponentially when the Palestinians claim Israel is a country of discrimination, occupation, apartheid and oppression. If this is so, why do they insist so strongly on the "right of return" and not rush to welcome their refugees with open arms into the newly liberated state of Palestine? The core of the problem is that Palestinian recognition of Israel as the state of the Jewish People would not only end the dream of the return to Palestine, but also of the destruction of Israel currently being implemented through the incitement and terrorist campaign waged by the Palestinians in their institutions, mosques, schools, terrorist organizations and foreign propaganda centers -- one facet of the myth being constructed of the existence of the "Palestinian People." Recognition would also give Israel Islamic legitimacy. Since the Nakba in 1948, the "expulsion" from Palestine, the Palestinians have been constructing their legacy. Their strategic intention is to perpetuate the conflict, not end it. That is also the strategic intention of the Israeli Arabs, who insist on preserving their "national Palestinian identity" while living in Jewish Israel, enjoying the rights and privileges of people in a democratic society, and at the same time hoping for its destruction, and sometimes actively participating in terrorist activity against it. The real reason Mahmoud Abbas wants control of the Jordan River bridges and crossings, and refuses to leave them in Israeli hands, is that the Palestinians in the West Bank want to duplicate the terrorism of the Gaza Strip -- smuggle in arms and establish terrorist squads as they did during the 1970s. They want to pave the way for waves of mujahideen to flood the West Bank and blow up Israeli civilians along the country's eastern border in the vain hope that Israel will finally be destroyed and a Palestinian state will be established "from the River to the Sea." Crossings left in Israel's hands would incidentally mean not only greater security for Israel, but for Jordan as well. During the first and second intifidas [uprisings], when the Palestinians boycotted Israeli-manufactured goods and refused to work for Israelis, we thought the boycott would destroy Israel's economy, but the result was that we hurt only ourselves. Goods made in Israel were smuggled into the occupied territories and sold at exorbitant prices, many times what they cost in Israel; and when Palestinian construction workers stayed home, the Israelis began using industrial building methods, so now the workers are still at home. I worry that the Palestinians are irresponsible and gambling with their fate and with their children's future. Instead of recognizing Israel as the Jewish state as part of a package deal of mutual recognition leading to a life a peace, they are trying to force the world unilaterally to recognize a Palestinian state. The danger is that when the Israelis realize that the Palestinians manipulators do not have any real intention of forging a peace agreement, Israel will withdraw from territories it does not want to rule, as it did in the Gaza Strip. The Palestinians will receive far less from Israel than they could have achieved through dialogue, and will spend the rest of their days living as bad neighbors in a state of hopeless, eternal conflict. A boycott of Israeli universities -- with laboratories responsible for so many Nobel Prizes and the creation of such stunning advances for the good of all humanity -- will not reduce Israeli academic excellence. The people who will suffer the most again are the thousands of Palestinian breadwinners who currently work in Israel's factories and fields, both in Israel itself and in the West Bank -- yet another example of the West's duplicitous crocodile tears in pretending to care about the Palestinians but in reality, not a jot. The resulting joblessness can only breed even greater unrest, moving both parties farther away from peace -- a strategy doubtless backed by many of these bogus-moralists in Europe from the outset. If I were an Israeli, I would insist on Palestinian recognition of the State of Israel as the homeland of the Jewish People. This Palestinian recognition would make it accepted as a religious duty for the entire Islamic nation to make peace with Israel, and make it possible for an independent, flourishing Palestinian state to be established on Israel's eastern border. Curious how both sides lay claim to territory that went undeveloped and barren until - the qualifying term - until Israelis returned the land which is biblically recorded, the land determined to them even previous to the Romans, until out of spite and jealousy, the Israelis transformed into a garden of Eden. The Quran fails to instruct how to treat said land. Instead, the area is horrid terrain, that is UNTIL the Israelis listened to the calling of God to replenish and nurture that land. This article should be sent to all university campuses around the West.The students in the West are under attack of Palestinian organizations who keep telling lies and the students believe these lies without trying to check the facts in history books and objective journalists. ​As an American Merchant Seaman I had the opportunity to visit Israel about 15 years ago. Along with several other crew members we hired a taxi cab and toured Northern Israel from Haifa, including Nazareth, Cana and the Jordan River area. The cab owner called himself a Palestinian, but claimed that this means he was not a Jew, but a Christian or a Muslim citizen of Israel. He was carrying a hand gun and claimed to be a Reserve member of the Israeli Army! Several Policemen were killed two berths down from our ship while we were there, supposedly by Muslim terrorists. For a formula that can lead to real peace in the region, see my "Common lands, common ground: Indigenous rights, Israel, Palestine and breaking the post-Oslo Accords logjam": http://goo.gl/OYCkYP. The state of Israel is a fact that cannot be discussed by anyone, and Israel for its history has to be a champion of human rights. Children of Israelis and of Arabs have a right to be taught living as brothers, not enemies. Clear, scholarly and honest. Well done! The powerful Muslims in Saudi Arabia and in the Emirates want Israel to be strong to help them make up for the failing US security in their region. Muslims are people who submit to Al Shariah, the law of Allah, His Name be praised. In this law the core issue is Jihad, the war against non-Muslims. This war has been going on from before the beginning of the Muslim doctrine. In this law no authority outside the Muslim authority can be accepted. Muslims are obliged to regain territory that has been under Muslim control before. Peace between Muslims and non-Muslims is forbidden in Al Shariah. The arrangements between Egypt and Israel and between Jordan and Israel are no more than long term cease fire contracts to be broken as soon as the Muslims feel they are stronger than the Jews. The obscene issue is the discrimination against Jews and especially against Israelis in many parts of the world. The "Holy" Quran? Full of holes, yes, indeed. So many reasons, as you point out, why the Palestinians will not recognized the Jewish State of Israel. But the core reason, the one that underlies all the rest, is because Jew-hatred is intrinsic to Islam. Jews are supposed to be and to remain conquered people, dhimmi, and their land, once conquered by Islam, is considered "Sacred Space," or waqfI- endowed for all time by Allah to Islam. All the other excuses flow from these. Why all the misplaced focus on "Palestinians"? The conflict over Israel is not a "Palestinian-Israeli" conflict. It is not even an "Arab-Israeli" conflict as it used to be called before 1967. The fact is that no Moslem country recognizes Israel's right to exist. The Islamic Republic of Iran is Israel's deadliest enemy and the Iranians are not even Arab, let alone "Palestinian". The conflict is not an ethnic conflict. It is not a territorial conflict which can be resolved by drawing new lines on old maps. The conflict has nothing to do with "settlements". The brutal truth is that we are dealing with an Islamic holy war (jihad) against the Jews - just like it says in the Hamas Charter. Both Allah in the Koran and Muhammad in the Sunnah command Moslems to make war against the Jews and to either subjugate them or to kill them. Any Moslem who recognizes Israel's right to exist would be violating the sacred commands of his god and his prophet. This goes very far beyond the "Palestinians". Your article presumes that this technique of flooding a nation [Israel] with immigrants, legal and illegal, is a PLO-Hamas trick. The truth is the ancient Romans and Syrians used a similar tactic of moving and resettling large populations outside of their original borders. The idea is to displace people dramatically and cause culture shock - forcing a dumbed down populous that is easy to control. But to understand who has modified the epic strategy in modern times, we must look to the Crown of England and its political regents, the Marquess' of Salisbury. They orchestrated a stratagem called "Balance of Power", together with de'tente, about 500 years ago [note: Henry Kissinger only used the British Empire terminology because he is an Anglophile and a world Elite.] The strategy uses subterfuge and stirring up trouble within a country for destabilization when it is necessary to reduce a country's influence within a region. Or the British would do the opposite by clandestinely granting aid to a country so as to check another country in the region. The policies in the Middle East are driven by Great Britain's strategy defined as "Balance of Power." Britain used its Commonwealth partners to ensure anonymity of the Crown, while Chatham House uses de'tente to sell the idea of the high culture of British rule in these delicate affairs. What we must understand is that the British elite love the Arabs and hate the Israelis because they view the Arabs as culturally more akin to British culture. This has been well established by documents from the House of Lords, and Chatham House [Milner Group - Lord Cecil Group], and thoroughly written about by Professor Carroll Quigley of Georgetown University. The Milner Group as late as 1932 desired the Ashkenazi Jews to fund the Palestinian development inside an Arab state [cite: Quigley, Round Table Mag.]. The times have changed and so the Royal elite desire the Arabs to develop the Middle East into a sustainable Dominion, where Arab money completes the region and the Banks of England receive large sums of Arab sovereign funds at the expense of Sharia within England. The point is: any Palestinian intifadas are sanctioned by the Saudis and the Commonwealth of Nations, so as to achieve the British Balance of Power in that region. If you can --extrapolate the immigration problems in the USA along the same ideology and tactic. The Balance of Power and Cecil Rhodes belief in receiving the USA back into the Commonwealth of Nations as a full member is becoming a reality. Fortunately Ali Salim is not the only Arab who has seen the light. His article underlines the fact that the most dangerous enemies of Israel and the Jewish people are not in the Arab/Islamic world, but in the inherently anti-Jewish West, particularly in Europe. Their ongoing campaigns for the demonization and delegitimization of Israel, and the dedication with which they operate their BDS programme, encourage the Arabs in their intransigence. Israel must stand firm and not withdraw from Judea/Samaria, the birthplace and cradle of the Jewish nation and heartland of the land of Israel, and we should not endorse our Western enemies' falsehoods by referring to this territory as the 'West Bank'. These comments, critiques and opinions are to be commended for as wide a propagation as is possible to deliver to target groups. A recent example of UN blunder re: Ms. Johansen and her involvement in an Israeli firm in "occupied territories" only sharpens the urgency of narrowing these divides. Thank you so much for writing such a perfect piece. The only shame is that most people are totally unaware of what the true situation is. So how does a message like this get out there - and I mean really out there - so that people get educated to the facts? I only worry that Israel is facing such opposition that worldwide anti-semitism is once again being accepted and is the status quo. Don't give up the land. God gave the Jews all of Israel. He did not give it to the Arab people. For people such as myself, who are not so learned in the history of the land of Israel, the use of the word Palestinian has given us an impression of a country of Palestine - taken by the Jews from the Palestinians, when in fact, there never was a country of Palestine. It was the name of the area inhabited by many peoples. During the occupation by the British, official documents referred to the two main groups of people of the area as Palestinian Jews and Palestinian Muslims/Arabs. From my limited reading it appears also, as the author wrote, the name, Palestine, was a Roman name for the whole area and was a derogatory slang name. It is a huge coup for the Arab Muslim leaders that they have been able to convert a common name of the area into a banner that gives the impression to those who do not read history that the Jews have stolen a whole country . For all of the Palestinian refugees who have been forced to live in camps for their entire lives, your solution would be the best. Why these poor folks have not been assimilated by the surrounding Islamic countries is beyond my ability to understand. Oh, I understand the historical context and the game being played, but on a human level, it is tragic. Bravo Ali Salim! "...This Palestinian recognition would make it accepted as a religious duty for the entire Islamic nation to make peace with Israel, and make it possible for an independent, flourishing Palestinian state to be established on Israel's eastern border."